Indian Prime Minister Narendra Modi has made it a point to keep visiting temples when visiting other countries. His visit to Dhakeshwari Mandir and Ramkrishna Math in Bangla Desh were part of his itinerary (June 2015). On the heels of this he is planning to visit the oldest mosque in India. This happens to be Cheraman Jama Masjid in Thrissur in Kerala. Contrary to the present perception and propaganda that Islam came to India with Muslim kings with sword in one hand and Koran in the other, the initial Islam in India came via the Arab traders in Kerala to begin with. It is due to this that the first mosque in India came up in Kerala. Wikipedia gives the brief history of this mosque. There were trade relations between India and Arabia. Arabian trader used to come to Malabar Coast even before the advent of Islam. With the rise of Islam in Saudi Arabia, the traders brought this faith with them. “Cheraman Perumal, the Chera king, went to Arabia where he met the Prophet and embraced Islam and changed his name to Tajuddin. From there he had sent letters with Malik Ibn Dinar to his relatives in Kerala, asking them to be courteous to the latter. 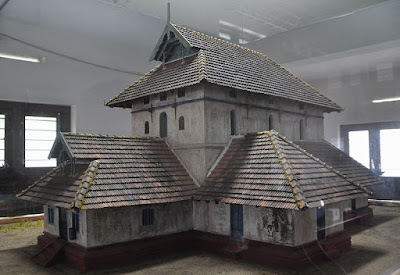 In the 7th Century, a group of Arabs led by Malik Bin Deenar and Malik bin Habib arrived in north Kerala and constructed a Masjid at Kodungalloor, naming it after their contemporary Cheraman Perumal. This interesting peep in to the history; when the issues related to mosque, church and temple is very much in the air; should help us to delink religion from politics. Modi’s associates within BJP and with RSS family (Sakshi Maharaj and the like) have begun asserting that Ram Temple will be built soon at the site where Babri Mosque was demolished. As Modi led NDA Government came to power we witnessed a series of attacks on Churches in Delhi, which many tried to pass off as series of thefts, despite the fact that not much was stolen; only damages were there, religious symbols were desecrated. The trend continues. In Atali in Haryana the violence was unleashed and the half built mosque was destroyed. In Rajagir (Bihar) the issue of holy place is being raked up. Subramniam Swami of BJP is facing a court case for saying that Temple is a holy place but mosque is not a holy place. The communal politics has been built around the issues related to identity. Even during freedom movement when the communal streams (Muslim League-Hindu Mahasabha-RSS) came up the issues related to pig in the mosque and beef in temple were made the pretext of violence. In Independent India the story begins with Ram Temple issue in the decade of 1980s when BJP made it a political issue. Its seeds were sown in 1949 when some miscreants installed Ram Lalla Idol in the mosque. The rest is history. The culmination of this has been that the Allahabad High Court gave the verdict on the ownership of land on the grounds of faith of majority community, and divided it into three parts. The judgment was a precedent of sorts as faith became the base of judgment. The matters are pending in Supreme Court but to keep the pot boiling VHP-BJP has started making noises for construction of temple. There is a long trajectory of incidents related to mosque-temple-dargah. Disputes have been constructed around them systematically. In Karnataka the Baba Budan Giri dargah was claimed to be the Datta Peetham. In Hyderabad near Charminar, Bhgyalaxmi temple is gradually being extended to be dangerously close to the Charminar. In Madhya Pradesh Kamaal Maula Masjid in Dhar has been claimed to be Bhojshala. In most of these places the campaigns were launched and polarization around these was brought in leading to electoral benefit to BJP at most of the places. Tipu Sultan got the temple of Shrirangpatanam repaired after it was damaged due to the attack by Maratha armies. Primary cause of destruction of Somanth temple was the massive wealth kept there. Even Babri Mosque has been the pretext of biggest communal polarization in recent times. Hindu King Shivaji got a mosque built at the entrance of his fort in Raigadh. ## The clever British policy of introducing communal historiography and dividing the history into Hindu, Period, Muslim period and British period paid them rich dividends and the communal streams picked this version from their angles and this came in handy to incite the feelings of people. Currently as India on one hand has claims for industrial growth and the figures of GDP are juggled to silence the critics, the fact is that India as a country is very low on the index of human development and per capita calorie consumption by large section is declining. At such a time the issues around temple and a mosque are a definite derailing of the priorities of the society. Lately many from RSS stable have been making damning statements about holy places. Yogi Adityanath of BJP said that non Hindus should not be permitted in Haridwar’s ghats. Somanth trust is barring the entry of non Hindus into the temple. Such attempts will be a great detriment to our social practices which have united the society. People from different religions keep visiting places of all the faiths. These are practices where people overcome the religious divides in practice. These will weaken the fraternity which is integral part of our values. While watching the TV debates on Ayodhya temple-mosque issue, one can see VHP spokespersons beating their breast that Lord Ram has to live in the tent, while he deserves to live in the Bhavya (great) temple. Here is the question, contrary to the belief of communal forces; for most of the medieval saints; the place of worship was within one’s own heart and soul. The identity issues have been brought to the fore by communal forces for their own vested interests. What we need is not the issues related to identity but struggle for a society which wants to see that all its citizens have bare minimum facilities, food clothing, shelter, employment health and dignity. Lord Ram and Allah are almighty and the mortals like us, including the breast beaters from communal formations, should prefer to see that the housing is provided to all the mortals, ordinary people so that they don’t have to live on the pavements-slums and suffer the ignominy. Can one hope that rather than presenting the past in a one sided; divisive manner we look at the story from all the angles, and put forth the rational one. We need to cultivate our faith for well being of all our society as a whole on the lines of Vasudhaiva Kutumbkam.